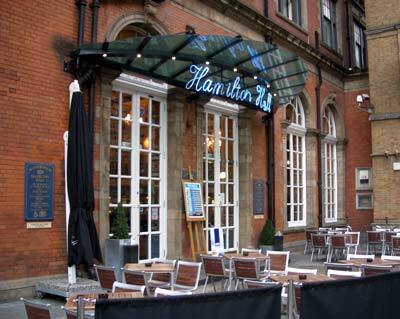 Closed for a short refurbishment at the end of 2013, The Hamilton Hall is always busy and offers good value for money in a splended environment. This is a large pub which can get busy, there is a good mix of city workers and travelers alike. If you're lucky grab a seat on the upper deck which over looks the main hall, it has it's own bar and offers a perfect view to pass a couple of hours. If you prefer the hustle and bussel the main hall is perfect. The outside seating is perfect in the summer to watch the many thousands of City commuters heading home. Some of the decor could do with replacing, but to be honest, with the volume of trade Hamilton Hall sees, they do a pretty good job. Service is always swift and pleasant. "This Wetherspoon pub is named after Lord Claud Hamilton, chairman of the Great Eastern Railway Company (1893-1923) which originally built Liverpool Street station. The pub is the former ballroom of the old Great Eastern Hotel."